I had my first brush with Tropical Diseases recently. As I’ve moaned about regularly since arriving in Bangalore 17 months ago, I’ve been mildly sick quite often here… I mainly put this down to a combination of unfamiliar cold-like viruses and the terrible air pollution here, along with large amounts of dust during the dry parts of the year. (Whereas local people often seem to blame any sickness on “the change in the weather”.) But up to now, I’d not really had anything serious. Usually a day at home in bed and I’m ready to go back to work the next day. But I started feeling properly sick about 10 days ago… woke up on a Monday morning with a raging fever and shivering like a maniac, like you might have with a bad flu, but also with terrible stabbing pains in my joints, which was a new experience for me. Something jogged a memory of a friend telling me about the Dengue Fever she’d had in Brazil, and I realised I needed to go to find a doctor to check it out. I have to admit that I wasn’t keen… so many services here are really hit-and-miss and unreliable, that the thought of going to the doctors for the first time (when, erm, properly ill) didn’t really fill me with confidence. But in the end I went to somewhere nearby that was recommended by a work colleague, and I have to say I was extremely impressed. Very clean and professional, pretty fast service, and the physician who saw me was a genuinely lovely and helpful man. 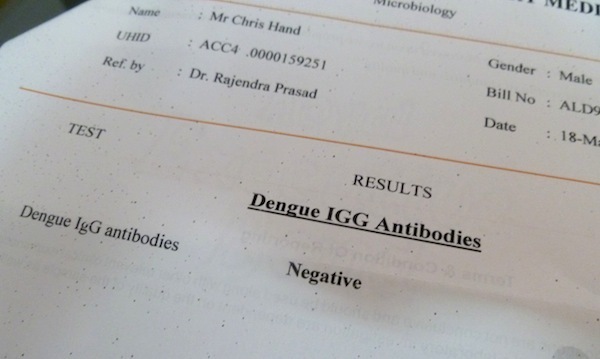 Anyway, after 2 sets of sample tests (both with results back on the same day), and a couple of consultations, the diagnosis seemed to be that it wasn’t Malaria or Dengue, but some milder “Dengue-like” viral fever, which the doc said he’d had himself recently. I’m now pretty much recovered I think… I’ve been back at work for a week anyway. But the recent rains and the inevitable increase in mosquitoes have made me slightly more conscientious about using insect repellent and covering up. Even in my own apartment!